but have the children eaten? oh, have the children eaten? but why are parents crying? oh, why are parents crying? so, why are poets beaten? oh, why are poets beaten? The last few chapters in Acts read like a modern day adventure movie. Paul, in the hands of Roman centurions is found on a ship with nearly 300 others. In the midst of their voyage to Rome, a horrific storm envelops them. In the midst of this storm they lose direction. When all of their cargo had been tossed overboard, when all of their hopes had been destroyed, when all of their dreams for the future had been dashed, Paul stood up in their midst with a message. And that message was to eat. Here – in the midst of a storm, in the face of death – communion was served. Perhaps the church, in its desire for order and predictability, has missed the true meaning of communion. Or perhaps we are not fully honest with what communion is intended to be. You see, when Christ offers the cup and bread to his disciples, it is as a meal served while disaster is imminent. 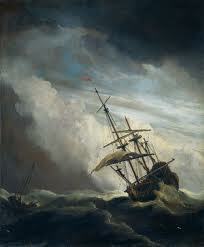 When Paul offers the bread to these sailors, it is as a meal while disaster is imminent. When we take communion with each other, perhaps it should be done as a meal in the face of the disaster that life can sometimes be. Take comfort in the storm that rages in a community of people with whom you can eat. And as you eat with them, remember who Jesus Christ was, is and promises to be. Both in the calm and especially in the storm. Lately I’ve been preparing for a week-long speaking engagement at our local middle school camp. Our theme for the week is See the Light. Know the Light. Be the Light. and we are using John 1 as our text. I am excited and nervous because I know connecting with 12-15 year olds is not something to take for granted, and yet I want them to leave the week knowing deeply the love Christ has for them, and the hope Christ offers to them. My talk on Monday night is based on John 1:3 – “Everything was created through Him, nothing – not one thing! – came into being without Him.” My hope is that they will leave that night with this phrase ringing through their minds: You are an original creation of God, made to carry God’s image with you wherever you go. In light of this, I am drawn to the underground world of street art. I was introduced to this world several years ago through a friend who spent time in Seattle as a “tagger”, marking various public locations with a specific, usually spray-painted moniker which others would begin to recognize as his signature. He had a scrapbook full of the different signs, buildings, trains, etc. he had tagged. Though it is an illegal practice, a visit to any big city demonstrates the ubiquity of this art. It wasn’t until I watched the documentary, Exit Through the Gift Shop, that I began to more fully understand the culture surrounding street art. 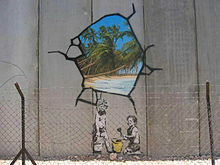 The film is produced by Banksy, perhaps the most famous of this enigmatic group. Though street art has been thrust into the headlines of popular culture, its most significant players fiercely protect their identity. They can only be known through their creation, and if you study their creations enough, you can learn to differentiate each artist by their style without ever seeing the artist in the flesh. While I don’t want to give away the story, the documentary focuses on one man, who through luck and a keen business savvy, becomes an overnight sensation in the street art world, though most of his work is done through articulating ideas to other artists who actually create “his” pieces. In the end, this “street artist” takes an original, creative, and unique process and turns it into a mass-manufactured, capitalism-flavored farce – or so it seems. It is an excellent documentary that you should watch – but I won’t give away any more about it. As I watched it and reflected upon it, I was struck by the way in which we are the “street art” of God – created uniquely in a certain style, that if one has the eyes (and heart) to see, will point to the original Creator in an undeniable way. People who know Banksy’s work know how to spot it among others who may try to emulate it. Whether it appears on a building in Bristol, UK or on the West Bank Barrier separating Palestine and Israel, his work is known. One of my favorite George Fox quotes is as follows – “Walk cheerfully over the earth answering that of God in everyone.” God, the most creative and unique street artist who will ever exist has placed his mark in everyone. Do we have eyes to see it? Can we uncover the crud that has been piled upon his “tag?” Can we spot his original work among so many who try to convince us that we are nothing more than cosmic accidents? Unlike Banksy, though, God wants to be known. He is not a secret, nor does He want to be. He has tagged the entire universe with His presence. Open your eyes and indulge your senses in God’s art. We had framed our campfire with a ring of folding chairs, and I was doing the smoke-hop, bouncing from chair to chair in order to evade the smoke that seemed to inevitably find me no matter which resting spot I chose. It was a beautiful evening in Kings Canyon National Park, one filled with a slight breeze that quickly excused the heat we had experienced all day. Our campground was carved into a scene which is difficult to recreate with words. Originally granite thousands of years ago, time and weather had turned the mountains encircling us into marble – smooth and impenetrable – carved through by a river that over time had created for itself a bed of incomprehensible beauty. The roar of the river served as a continuous backdrop, upon which birds overlaid their chirps, fires their crackles, and children their laughter. It was in this place of relative peace that my attention was drawn to an RV lumbering into my serenity, drowning out the natural noise and replacing it with the drone of an oversized engine tired from lugging a small house up and down these oversized mountains. The driver’s name was Thomas, and through a thick European accent, I learned that he and his family were from Switzerland and were passing through this remote location as part of a months-long road trip. As soon as it felt natural to move on from the requisite small talk, together we marveled at our surroundings before returning to our respective campsites. Snicker Salad. The utterance of this phrase catapults my entire self back nearly 10 years, to the first time I was served this delightful dish by our new friends, Shelly and Eric Dirksen. Originally from Iowa, they had found their way to the Northeast where Eric and I were graduate students while our wives served the community as a teacher (Shelly) and a social worker (Erin). The Dirksens became dear friends of ours, and when they left Massachusetts to serve as pastors in Cooke City, Montana, we all waved goodbye through tear-filled eyes, promising to see each other as often as we could. Our planned family vacation in Kings Canyon afforded us the opportunity to reconnect with the Dirksens after nearly 7 years of being apart. Now living in Davis, CA, they are doing the difficult work of planting a church, which we were able to attend one Sunday evening. While there were many aspects of the service with which we resonated, the most meaningful portion of it was Communion. As the service moved along, leading up to the communal engagement with the bread and wine, I expected (for denominational reasons) an invitation to join in the ceremony only if certain conditions were met. As Eric ushered the congregation into the experience, his explanation and invitation blanketed me with grace and acceptance, with sincerity and warmth. There was no hint of superiority, of warning, or of fencing the experience. It was, as Eric stated, for all who longed to walk along the difficult yet glorious path set before us by Christ. We, virtual strangers to the community of Christ Church in Davis, CA felt welcomed in that moment, drawn together by the presence of Christ freely offered to all. Our family had just begun making s’mores when Thomas and his family walked ever so cautiously over to us. As they approached it was with an expectation of being accepted, of being welcomed. Our entire family (all 15 of us!) simultaneously stood up, inched our multi-colored canvas chairs back, and added 4 more chairs to the circle. As they looked curiously upon our ritual of marshmallow roasting, their eyes beckoned for an explanation of what we were doing. Someone in the group described the process of making s’mores, and as Thomas and his family listened, they nodded along, noting that they had heard of our American ritual but had never before experienced it. So we stuck marshmallows on the end of sticks and taught them how to roast to perfection, then laid the hot, gooey marshmallows on top of the chocolate and sandwiched it between two pieces of graham cracker. Their faces displayed curiosity, a bit of enjoyment, and overall, a sense of acceptance in this unique practice – a ritual experienced countless times by us, but by them just once. It was in this moment that I realized what we were having right then was a communion service. There were certainly no words uttered about a marshmallow being the body of Christ, or the melted chocolate being his blood, but there was a connection being made between people who shared only a common place and a common meal, whose paths had crossed in the most immaculate marble cathedral ever created, and who would probably never meet again, save for the recollection of memories of that shared s’more on a starry night in the midst of a canyon named for royalty. Two experiences of communion, two experiences of encountering Christ in unexpected ways. Friends, old and new, hewn together by the threads of hospitality, of an invitation into a shared experience. That was communion. That was community. That is Christ. I grew up in the Quaker church – you know, the kind that never practiced an outward symbol like communion or baptism, confirmation or speaking in tongues. It was a Quaker church, after all. And everyone knows that the Quaker liturgy is no liturgical rites expressed in outward forms. Everything good contains the presence of God, so why limit it to a couple of frequently (or infrequently) practiced, rote exercises? Then, during my 20s, I married an Episcopalian, moved across the country, and ended up regularly attending two different liturgical services over 10 years. Talk about a change! Both churches I went to practiced weekly communion and frequent baptisms. All three of my children were baptized while we attended these churches, and I participated in communion every time it was offered. So when we returned to the Northwest, and to the Quaker church I grew up in, I knew I was going to miss the symbolism and communal experience of people moving forward forward, in one great line, to partake in an experience that confirmed to everyone a desire to be reminded of the fullness received when we commit our lives to Christ. Yet those church experiences also seemed to be missing the very thing that George Fox and Quaker meetings in general did well, at least in my experience – that is, recognizing the immediacy of Christ in all things, not just in special ceremonies done inside church walls. This was perhaps most evident in what is called “fencing the table.” Essentially, each communion service was initiated by warning people who might partake in it that if they were not baptized, or were not committed followers of Christ, they would be condemning themselves by eating the bread and drinking the wine. I can still remember the first time I heard this explained in the church – and the confusion that crept so silently into my very bones – wasn’t Christ’s blood and body shed for all? Wasn’t it an invitation to life, not a warning that one could, nay, would be condemned for experiencing Christ with the wrong motivations? This warning was too much for me – more of a power play than an invitation to a great feast served in honor of all, for all, and even though I miss the experience of communion, I do not miss the practice of fencing the table. Christ is for all, can be experienced by all, and must be offered to all – no matter the motivations (known and unknown) we bring into any experience. Christ does not need us to stand up for him; Christ does not need us to protect him. Christ needs only for us to offer all of who we are and all of who we know him to be – and then allow the Spirit to usher all who are ready into the presence of Christ, wherever and however that may look. In my next post I’ll share two stories of how this happened for me during this past week. How have you experienced Christ lately? Have you ever felt fenced off from experiencing Christ? How did you respond?